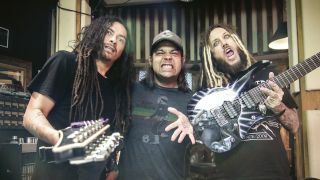 Three years on from The Paradigm Shift, Korn have stepped behind the soundboard again to piece together their 12th studio album. As guitarist Munky tells Metal Hammer, the band have tucked 2011’s adventurous The Path Of Totality firmly under their arms and combined it with the monstrous energy of 2002’s Untouchables, resulting in an updated, upgraded sound that is both a retrospective homage and a bright-eyed gaze toward the horizon, replete with a guest vocal from Slipknot’s Corey Taylor. Produced by Nick Raskulinecz (Alice In Chains/Deftones - pictured), new songs like forthcoming single Rotting In Vain aim to provide diehard fans and newcomers with the disturbing depth that Korn fans have become accustomed to. Having enlisted the help of trippy pop artist Ron English, Munky teases how the new album’s psychedelic artwork pays tribute to their 1999 opus Issues and the iconic ragdoll image associated with the Bakersfield outfit ever since.